!!! 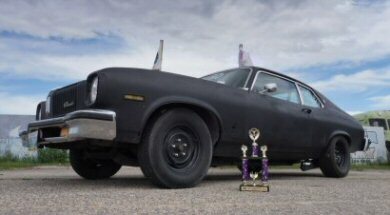 2018 Interlake Dragway Heavy Street Champion !!! Ran car in 'DRIVE' with exhaust cutouts open. Replaced stock L6 'Throttle Cable' during time trials with proper 'V8' Throttle Cable. First Pass launched at 2000, shifted at 5500 (1st to 2nd), 5200 (2nd to 3rd) with exhaust cutouts open. Second Pass ran car in 'DRIVE' with exhaust cutouts open. Ended up 'Runner-Up' in Finals despite some ignition issues which plagued our day. Was running Omega in 'DRIVE' with exhaust cutouts open. The Accelerator Cable Grommet which holds the cable to the pedal broke, so we lost throttle. 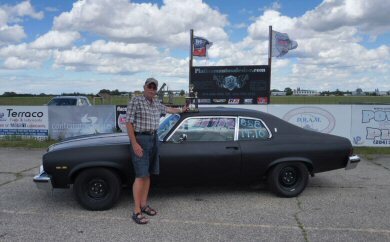 Thankfully I just happened to have taken the Nova out too this weekend, and Dad was able to continue in 'Time Trial' passes in the 'Heavy Street' Class. Fortunately I happened to be carrying a spare cable grommet. I broke one years ago and ordered a few to have around. Despite quicking fixing up the Omega, Dad carried on the day using the Nova. 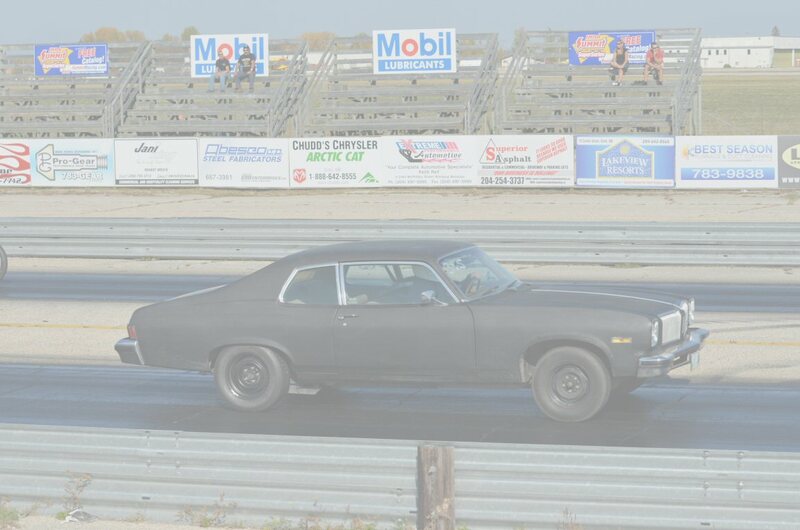 Ran the Nova in 'DRIVE' with FULL street trim and drag radials. 'Red Lite' in the 3rd round and thus eliminated. Dad cuts a 0.5001 in 'Time Trials' ... best reaction time ever for him. Despite being eliminated in first round, second place rival was eliminated in first round when he red-lite allowing Dad to remain at the top of the class. 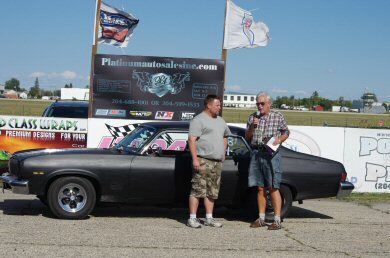 Remaining competitors were able to gain ground in the points standings. 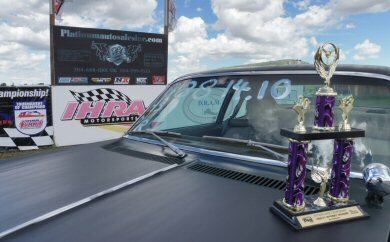 There was no racing due to weather conditions resulting in poor track conditions and low car counts. Car ran VERY well, Dad said it felt good going down the track. 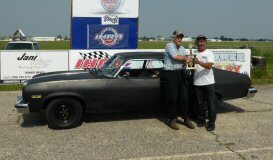 Dad was able to walk away for the 2nd time this season, winning the 'Heavy Street' class !! Ran car in 'DRIVE' with exhaust cutouts open. Car felt good and was VERY consistent during time trials ... making it easy to pick a time for eliminations. The curse of the '1st Round' exit returns, as Norm left before the Green light and our day was over early. Since last weeks big win, we completely changed the fuel system in the car. We changed over from the stock mechanical setup to a NOS/Holley Sniper electric setup and regulator. We also pulled the stock steel 5/16 line and replaced it with 3/8 steel-braided line from the back to the front. 6 Passes, Zero Issues!! Even tried bumping up the timing to 34, and running 91 Octane and car ran the same. Ran car in 'DRIVE' with exhaust cutouts closed to keep the RPMs down and hope to keep the bowls from draining out in 3rd Gear due to Fuel Pump/Fuel Pressure related issues. 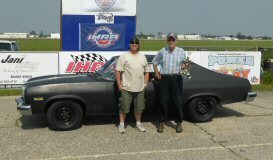 Car ran well enough, and consistent enough for Dad to walk away winning the 'Heavy Street' class !! After the problems with RPMs at the high end of 3rd Gear, we went through the motor, ignition and fuel systems of the Omega. Despite all changes, the high-end miss still remains. With setting the floats higher in the primary cause to miss to start closer to 5000 than at 4500-4800. Issues in 3rd Gear still persistant, changing the jetting did nothing to help .. AFR leans right out. We have bigger problems, will need to look further into it. 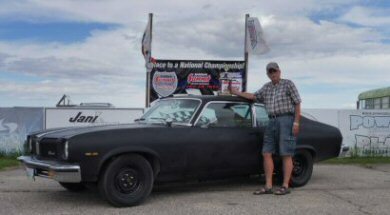 Watching cars of all classes making passes in the first round of eliminations and noted that alot were breaking out by 0.1 of a second, I advised Dad to change our 'Dial-In' time from 13.80 to 13.70 which resulted in him being eliminated in the 1st round. Omega seem to have be having some issues on the top end, wouldn't climb past 4500-4800 rpms in 3rd gear. AFR leaning right out. The plastic retainer which holds the throttle cable at the pedal broke. Using washers & bolts, managed to wedge a broke portion of the retainer with the cable to hold the cable to obtain WOT. Added spacers to throttle cable at the pedal end to obtain 'WIDE OPEN' throttle. I've taken a job at the track doing announcing in the towers at the track. That means my Dad is racing on his own and I'm not there to analyse and talk things over with him after his passes. Dad dialed in at 14.70 and was making a GREAT pass. Towards the end, and even letting off didn't help and still ran a 14.64 .... breaking out. Dad still comfortable running the car in drive to have it shift constantly. Ran some good lights, decent times but unfortunately his nerves got the best of him and red lighted in first round of eliminations. The car was SLOW today, we're getting wide-open throttle ... can't figure out why. Maybe the weather, it's VERY humide today. Car was left with exhaust hooked up and shifted automatically in drive. Still should of ran better then the slips show. Modified Gas Pedal so Pedal Arm won't flex to get WIDE OPEN throttle. I thought the car ran good considering it's not being shifted and ran in DRIVE. New Cap & Rotor installed. Round 2 of Eliminations was a BYE round. 3rd pass in Time Trail was shifted. Car seems to be running good, however our times have dropped. Trying to figure out what's going wrong. Discovered after racing, that the thick edge of the floor mat was under the gas pedal, which may be part of our problem. Test pass at the end of the day shows it may be part of the problem, but even shifting the car ... I can't get a 13 second pass. Changed secondary squirters to .25 from .28 to try and fix a bogging/hesistation problem off the line. Dad decided to run the car in DRIVE, so that the shifts would be more consistant then as if he shifted it. Ran into some issues with the throttle sticking, ended up replacing throttle cable during lunch break. Discovered we are not getting wide-open throttle, but with time trials done, we will address this later. Track ran limited time trials, giving us only 1 pass due to weather and they where also trying to make up for a rain date on the last track outing. Wasn't really fair to only get 1 time trial, but that's the way it went. Noted down what I launched at, shifted at and what my results were ... and even made a few passes in 'drive' to see what kind of times it would turn. Car was turning some really good times for us today ... low 13s, gotta be happy with that! Car was running REALLY good for us. Dad wants to work on his reaction times and cutting a good light! Car was generally running a little slower for us today, but was pretty constant. 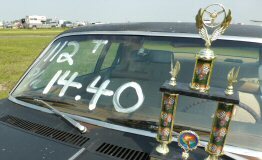 Car was running REALLY good for us, not sure what happened in the 2nd round with the 60ft' ... maybe Dad spun off the line. On the plus side, Dad made it to the 2nd round of Eliminations. Had some issues on Saturday with the car breaking up at the top end. Ruled out all ignition copoments. We believe it to be the fuel was getting too hot. Let the car cool down below 180, car seems to run good between 180-205, 210. Once around 210, we ran the risk of the car breaking up again at the top end. Sadly, it spuddered again at the top end and Dad was eliminated after the first round. Removed Vacuum advance off distributor and running mechincal advance only. B&M Pro Ratchet Shifter installed. Rebuilt the 355 SBC, after it started to knock at the end on our last outting September 18. Crank, main & rod bearing material scattered throughout the inside of the motor as well as spring material from the rear-main Seal. Fixed kink'd metal fuel line. Replaced metal line. Removed 'Transmission Kickdown' cable connection from Carb (Cable was preventing FULL throttle). 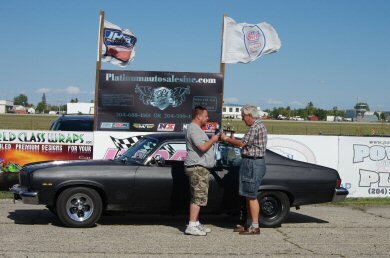 During the last week of July 2009, I decided the hell with the 305 and swapped in a new powertrain. Going into the Omega, is a fresh 355SBC, rebuilt TH350. In early April of this year, some new parts where ordered for the rear-end. 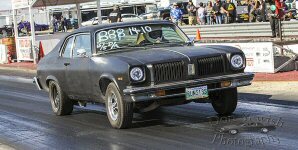 We had Motion Performance installed a Detroit True-Trac Posi with Richmond 3.73 gears. During the month of May, I installed Competition Engineering Bolt-In Subframe Connectors (#3116), Lakewood Traction Bars & Lakewood Driveshaft Loop. A set of BFG g-Force tires were ordered (235/60/15) and mounted on steel rims. Took the Omega out to Gimli, to run it and give us a baseline of how the car ran, with it's current powertrain. Slomega was sporting a 305 SBC, TH350C and 2.73 Open rear. I was hoping to blow up the 305, giving me a reason to install the 355SBC powertain I had recently purchased. The 305 held up to the beating and ran beautifully ... altho slow, it lived up to the name of the car 'Slo-Mega'.